News, tips and tricks from Google's Gmail team and friends. 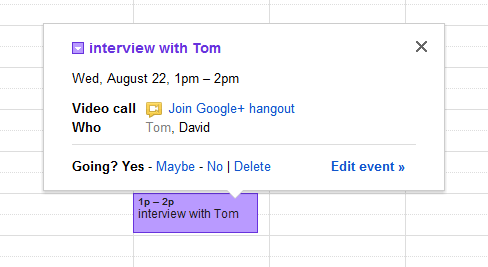 Do you use Google Calendar to schedule catch ups with distant friends and family? Now, if you've upgraded to Google+, you can schedule a face-to-face video chat right from Google Calendar using Google+ Hangouts. It takes one click to add a hangout to an event and another click to join the hangout. Give us feedback in our Product Forum.